Surf’s up! This Memorial Day weekend, 31.2 million Americans will buckle up and hit the road in hot pursuit of the best barrels ever, or just a weekend filled with fun and relaxation. So grab that bottle of sunblock left over from last year, dust off your floppiest sunhat, and systematically pack your luggage into your car like a Tetris grandmaster, because it’s (almost) officially summer. Before the fun begins, however, most summer road trippers will prepare to hit the road by fueling up and hoping that they avoid sitting in a conga-line of cars stuck in traffic. No matter where they’re headed, drivers will be spending big bucks on gas, thanks to spiking summer prices. In fact, the average Memorial Day weekend road trippers will spend about $118 on gasoline, and Americans will collectively spend over $1.4 billion on gasoline, just this weekend! Sure, gasoline is a necessary expense that accompanies any trip no matter how long or short (unlike things like an oversized foam cowboy hat, which may be filed under “unnecessary items.”) But even though buying gasoline is a necessity, we have opportunities to choose how much we need and therefore, how much we spend on gas this year and on future road trips. Those in the market for a new (or new to you) vehicle should consider fuel efficiency as a priority if they are looking to save money (and emissions) on summer road trips – even if the fuel efficient technology costs a bit more upfront. For example, a Ford Fusion SE Hybrid costs $3,500 more than its base conventional gas model, but consumes $9,000 less in gasoline over its lifetime. Outside of the showroom, you can show your support for the historic fuel efficiency and global warming pollution standards, finalized last year, that will nearly double the fuel economy of new vehicles by 2025. 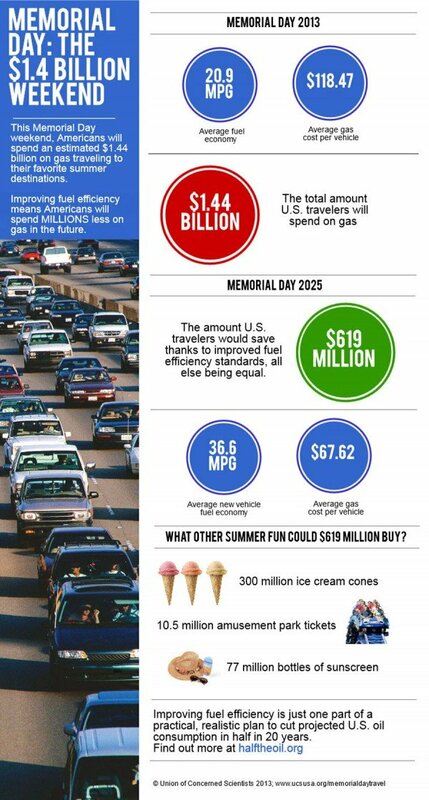 In fact, if Americans could drive those more efficient 2025 vehicles today, we would save about $619 million on gasoline this Memorial Day weekend alone. Those millions could be spent on everything from ice cream cones to tickets to your favorite amusement park, or saved for the next trip or the next car. Overall, at gasoline prices of $3.50 per gallon, these standards will save the average driver of a new 2025 vehicle some $8,000 over that vehicle’s lifetime, compared to today’s average vehicle. In addition to saving drivers at the pump, fuel efficiency standards are an integral part of our realistic plan to “Half the Oil,” or reduce projected U.S. oil consumption in half in 20 years. These standards are already giving consumers a wider range of affordable fuel-efficient vehicles on showroom floors, with fuel-saving features such as stop-start technology and direct injection becoming increasingly commonplace. As conventional and hybrid technologies continue to become more efficient, manufacturers will be able to meet even higher fuel economy targets that will provide consumers with even more savings. For this weekend, keep in mind that you don’t have to wait until you’re in the market for a new car or truck to improve your fuel efficiency. Drivers can save money on fuel by following a couple simple practices such as making sure tires are properly inflated, putting bulky items inside the vehicle instead of on top, and parking in the shade. Check out these additional tips and tricks to maximize your current fuel economy and help you save no matter what you drive, and have a safe and totally excellent Memorial Day weekend!